All of Chad Summers’ horses had their heads out the stall anxiously awaiting dinner. One was pawing the ground, some were nickering, some were squealing. Well, all but one. In the end stall, Mind Your Biscuits had other things on his mind. The seventh race was going off and he peered intently out the back window taking in all the action. Even between races, he was more interested in enjoying his view of the track, whether it was the few fans sitting on their lawn chairs or anything else that caught his interest. Every once in a while, he would walk over, grab a quick bite to eat, and head back to his window. That pretty much has been Summers’ only problem; getting his star to have a normal uninterrupted dinner. Other than that, Mind Your Biscuits makes Summers’ job much easier, as he is one of the rare throwbacks in the sport today. A horse who does anything you ask him to, anyplace at anytime, whether it is going six furlongs halfway around the world in Dubai or a mile and an eighth right there in his own backyard in Saratoga. Not many horses go from a New York-bred stakes at Finger Lakes to back-to-back victories in a $2 million sprint at Meydan. Not many can place twice in the Breeders’ Cup Sprint at Santa Anita and Del Mar and stretch out to finish a fast-closing second in the two most prestigious flat mile races in the country, the Met Mile and Cigar Mile. Not many can run a blistering seven furlongs in 1:20 4/5 in the Malibu Stakes at Santa Anita and 6 1/2 furlongs in 1:15 1/5 in the Amsterdam Stakes at Saratoga and 1:21 4/5 in the Belmont Sprint Championship at Belmont Park. And in his two Breeders’ Cup Sprint placings, they ran the six furlongs in 1:08 3/5. Both times he was flying at the end. And stretching out in the Met Mile he ran his heart out to be beaten a nose by the swift Bee Jersey in 1:33 flat and was in front one stride past the wire. In his second Golden Shaheen victory, he ran the six furlongs in 1:10 flat, the fastest Golden Shaheen run at Meydan. This is a horse who has finished first or second in grade 1 stakes at six furlongs, 6 1/2 furlongs, seven furlongs, one mile, and 1 1/8 miles. And he was second in his career debut going five furlongs at Saratoga in :57 4/5. He became the only horse to win the Dubai Golden Shaheen twice, taking the second one with one of the most explosive stretch runs seen in years to run down two of the fastest sprinters in the country, X Y Jet and Breeders’ Cup Sprint winner Roy H. Oh, yes, he also has two wins, two seconds, and a third in his five starts over a muddy or sloppy track. In all, he has won or placed at Belmont, Aqueduct, Saratoga, Santa Anita, Del Mar, Meydan, Parx, Gulfstream Park, and Finger Lakes. With his second-place finish in the Whitney, Mind Your Biscuits became the first New York-bred to break the $4 million mark in earnings. Behind him with $3.9 million is Kentucky Derby and Preakness winner Funny Cide. You don’t see many horses these days quite like Mind Your Biscuits, a horse named after a country western song (“Biscuits”) that goes, “Mind your own biscuits and life will be gravy,” but who likes rap music. The bottom line is, in today’s racing you just don’t see confirmed sprinters, running in 16 sprints, versatile enough to carry their form into prestigious grade 1 races like the Met Mile, Whitney, and Cigar Mile. And as of now, it looks as if the ultimate goal is the Breeders’ Cup Classic, even though he is proven at six furlongs, having run two huge races in the Breeders’ Cup Sprint, and would likely be the favorite or second choice in the one-turn Breeders’ Cup Dirt Mile. But you’re not dealing with your typical trainer/owner in Chad Summers, who picked out Mind Your Biscuits at the sale and owns him with his father and brother, as well as Michael Kisber, Head of Plains Partners, J Stables (Summers' main client in Ecuador), and his latest partner, Japan’s Shadai Farm. Although in his early thirties, Summers, like other New York City horsemen such as Allen Jerkens, Hirsch Jacobs, and Nick Zito, has plenty of street savvy, is not afraid to step out of the box and take chances, and has learned every aspect of the sport since his younger days sneaking into the Belmont Park backstretch. He is old school and as much of a throwback as Mind Your Biscuits. Like Jerkens and Jacobs especially, there is no horse he is afraid to take on. The horses those two legends defeated, whether with fillies, allowance horses, or former claimers, reads like a Who’s Who of all-time greats. Summers also values the opinion of Mind Your Biscuits’ exercise rider Rikki Ramdial, who is another who knows the horse as well as anyone. To say racing has always been in Summers’ blood would be an understatement, as there is little he hasn’t done – hotwalker, groom, stable foreman, clocker’s assistant, radio analyst and host, pressbox gofer at Keeneland, racing manager, and writer for the Thoroughbred Times. Growing up on Long Island, he would go to the races and to Breakfast at Belmont with his dad and brother, and while other kids were cutting out baseball box scores, he would cut out entries and results from Newsday and keep records of jockeys and who was riding who. He gained additional knowledge attending the University of Kentucky, and from there, he continued to follow his dream to be part of racing. In the summer of 2004, Summers went to work for Paraneck Stables and trainer Jennifer Pedersen. He still holds a soft spot in his heart for a 3-year-old New York-bred filly named Say Hey Willie, a daughter of Artax who had EPM and everyone had given up on her. But he would walk her an hour every afternoon at Aqueduct and graze her in what little grass there was. He spent his own money to get her massages. He took her to Saratoga for her career debut and forgot her blinkers, so they had to borrow a set of blinkers, She won at odds of 11-1. He still remembers that incredible feeling of seeing her move into contention at the head of the stretch, and has retained that feeling ever since. “When they turn for home and have a chance to win, there’s no better feeling in the world,” he said. Nothing about Mind Your Biscuits’ story is typical. It was Carrie Brogden of Machmer Hall who first spotted the colt’s potential when she purchased him at the Keeneland January mixed sale for $47,000. She thought he was beautifully prepped by Samantha Will and her husband Chris Baccari. A big leggy colt, he was fairly fashionable at the time with the success of another son of Posse, Caleb’s Posse. The price was more than double the average price of Posse’s yearlings that year. But he was a “lovely physical specimen,” according to Brogden, so she didn’t mind overpaying for him. Soon after, she were approached by Heidi Cecil and Marne Fauber of Imagine Bloodstock, who wanted to become partners in the colt. They prepped him at their farm in Florida, but by the time of the Fasig-Tipton New York-bred Preferred Sale, three things were against them. He was stabled in an experimental tent set up by Fasig-Tipton where their new barn is now; Posse was now considered a one-horse wonder and his popularity, even in New York, was waning; and most important, Mind Your Biscuits had gotten a big gangly behind, according to Brogden, and he was weak and sore in his hocks. “He still had that monster frame that he always had, but it had just gotten away from him a bit as he continued to grow,” Brogden said. As a result, there was no action on him at the barn, and the only people who showed any interest were Susan Montayne and Chad Summers. The colt went into the sale without being vetted by anyone, and Brogden knew the chances of him selling would be slim. As expected, he failed to meet reserve and was bought back for the same $47,000 she paid for him. Immediately after the sale, Summers and Montayne offered to buy into him. Brogden presented their offer to Cecil and Fauber and they sold their interest in him, while Brogden cut down her interest, retaining one-third of the colt. Summers and his dad were pretty much looking to buy a nice New York-bred they could pinhook as a 2-year-old, so they put him in the Ocala April sale. But Biscuits’ breeze was scheduled for the last set, not ideal for fast times, and although he went his eighth in a respectable :10 3/5 with a strong gallop out, there was little interest in him. “It always makes me laugh and brings a smile to my face to think that one of the fastest sprinters in the country was deemed ‘too slow,’” Brogden said. Rudy Rodriguez trained Mind Your Biscuits initially, and then after four races he was turned over to Robert Falcone Jr., who had excellent success with him, winning the Amsterdam and Malibu and placing in the Breeders’ Cup Sprint and Gallant Bob Stakes. Following the Gallant Bob, just weeks before the Breeders’ Cup, Summers sold minor interests in the horse to Sol Kumin and Michael Kisber. Following the Malibu, Summers got his trainer’s license and took over the training of Mind Your Biscuits. “I wasn’t looking to train,” he said. 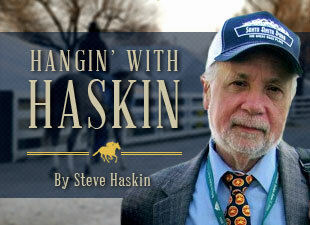 “I was happy buying and managing, having bought stakes horses Tommy Macho and Off the Tracks. But some of the owners twisted my arm and asked me to do it. When owners ask you to do that it’s difficult to say no. We grew from five horses to 50 in a month and a half. It’s not easy, but you just try and learn things every single day and look ahead. Once he crossed the finish line in the Malibu I started thinking about the Golden Shaheen. Summers learned a great deal from Pedersen, and observed how she trained the babies and gave them foundation. And he learned a lot about the sales and not being afraid to ship out of town. While most trainers wouldn’t make such a dramatic move with a confirmed successful sprinter, Summers has so much confidence in Mind Your Biscuits, he believes there is little he cannot do. Although he has come from far back in many of his races, in the Malibu, he was only two lengths off a scorching :43 4/5 half, and in the Gulfstream Park Sprint Stakes, he was four lengths off a :44 3/5 half. In the Whitney, with Diversify the lone speed and in total control of the race, he laid five lengths off a strong pace of :46 2/5 and 1:10 3/5, and although he wasn’t able to catch the winner, he dug in gamely when it looked as if the Excelsior Handicap winner Discreet Lover was going to blow by him. Not only did he hold him off for second, he was in front front galloping out past the wire. In the Met Mile, he was giving the winner four pounds and finished 5 1/4 lengths ahead of the third horse, the brilliant and classy Limousine Liberal, who he was giving five pounds, while earning a 109 Beyer speed figure. But the race that had to be seen to be believed was the second Dubai Golden Shaheen, a race he won the year before by three lengths. This year, he was dead last at the top of the stretch on a notoriously speed-favoring track, and even in deep stretch he was still completely out of the picture. X Y Jet, coming off three consecutive stakes victories, had gotten the better of Roy H, also coming off three consecutive stakes victories, including the Breeders’ Cup Sprint, and looked like a sure winner. But Mind Your Biscuits displayed a breathtaking a burst of speed and somehow just got up at the wire to win by a head. In his second Breeders’ Cup Sprint, Summers knew he was in trouble as soon as he shipped into Del Mar and saw how short the stretch was. All he could think of was, “How are we gonna get up on this track?” He told jockey Joel Rosario to lay closer to the pace, but when he dropped back to 10th, he had no shot to win. Still seventh at the eighth pole, he again kept coming with a relentless stretch run, but had to settle for third. Even the fans knew he had little or no chance, sending him off at a whopping 9-1. It still was a big improvement off his previous start in the Forego Stakes. Summers could see he wasn’t himself training and just wasn’t acting like himself. He was stabled in a bad location, across Nelson Avenue and far away from the action with nothing to look at, and it was obvious he was not a happy horse. Summers was hoping that when he saw the crowd on race day and they sprung the latch he would be back to his old self. But it didn’t happen, and he ran his only poor effort. As soon as he got away from Saratoga and started preparing for the Breeders’ Cup he trained much better and was back to his old self. Now it’s all about enjoying the gift that is Mind Your Biscuits. Whatever the future brings, he owes them nothing. Summers calls him a “happy horse,” who has taken them on an incredible journey, the next step likely being the nine-furlong Lukas Classic at Churchill Downs. That can serve as a springboard to the Classic, or if they change their mind they can shorten him up for the Dirt Mile or even the Sprint. It is extremely rare to have a choice of those three races. But then Mind Your Biscuits is a rare horse. Boy, would Allen Jerkens and Hirsch Jacobs love to have had him. But despite being true geniuses in the sport, even they would have trouble getting Mind Your Biscuits’ head away from that back window and into the feed tub for more than a few minutes at a time. Sometimes, however, it’s just best to leave a good thing alone. Perhaps Brogden summed up Mind Your Biscuits best. She realizes had she and her husband Craig kept him after buying him back as a yearling, he would have been gelded right away, as they do with 99 percent of the colts they end up having to race. You can look at a young horse and observe his confirmation and study his pedigree, and watch him breeze at the sale. But there is one thing you can never see.